I covered it with pattern paper that I Mod Podge'd and then sanded. 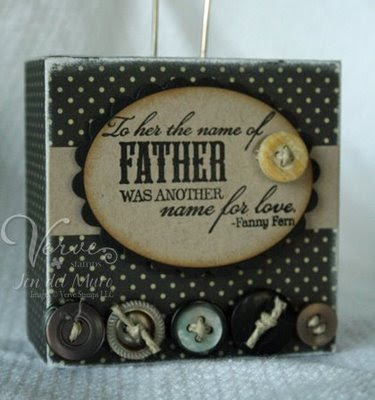 I then added the sentiment (from Dad's Day) inside the oval die cut (Nestabilities) and added buttons in black, gray and brown for my embellishment. This was a very simple project that I am sure...I mean I hope...any (especially MY) guy will love. We can't wait to see what you come up with for this month's Project Parade! 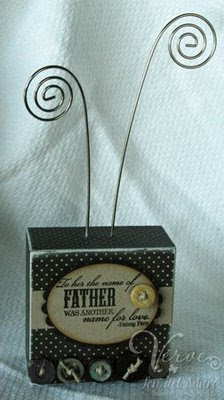 To play along, just make a project or card that fits your style and celebrates a man in your life. Verve Stamps are not required, but if you've got 'em we love to see 'em! Then just add a link to your creation to the Mr. Linky form below before 8PM Mountain on Saturday, June 20. Two lucky participants will win a stamp set of their choice from the Verve Store. We've also hidden another $25 gift certificate somewhere along the parade for a random commenter. So if you like what you see, be sure and give a little shout out in the comments of each post! Have fun and good luck!